Our long-time readers know that we’re HUGE fans of the Single Malt & Scotch Whisky Extravaganzas, and we make a point of attending any and all of them we can. Details of past events can be found here and here and here (among others). This spring’s schedule is below. 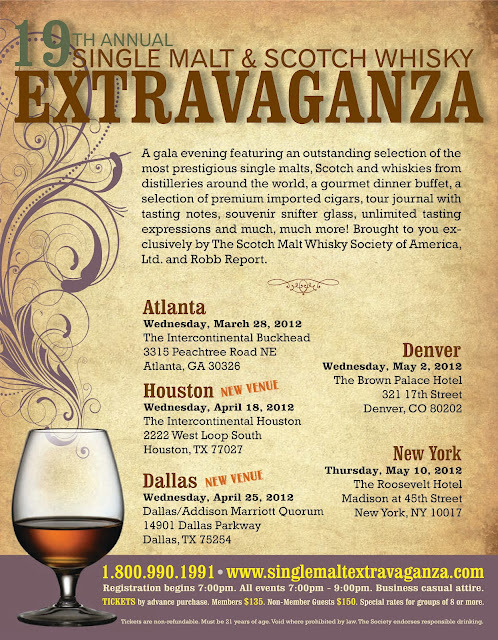 The Extravaganza features rare and exceptional single malt, Scotch and unique whiskies from around the world. There’s a boss dinner buffet included, and they even kick in a pair of cigars to enjoy after the show. The brand representatives on hand are top notch, and the attendees are among the finest of folks (we mentioned we attend often, right?). All events are from 7:00pm-9:00pm, and registration begins at 7:00pm. Attire is business casual, with jackets preferred on the gentlemen–and all the other males. No denim, fleece, sweats, tear away basketball pants, cheese head hats, or any other athletic wear. Oh, and there are special rates available for groups of 8 or more, so put that party together now! or by calling (800) 990-1991. Once again, use the special Malt Impostor promotional code “TMI2012” to receive your first two tickets at the Member rate. Cheers!